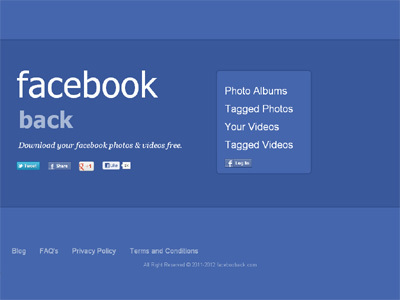 facebook back allows visitors to create and download a back up on any or all of their facebook videos, tagged videos, photo albums, and tagged photos. The site is free to use, requires no registration, and downloads are instant. Most people don’t realize the value of such a service until their facebook account gets hacked or deleted. Many people have photos and videos on facebook that they no longer have on their phone or computer and if they do, they are spread out among numerous devices and folders. Facebook back allows users to save all of their photos and videos and tagged photos and videos into one safe location on their computer in the event that they become one of the 20,000 people each day that lose access to their facebook account due to hacking or deletion. The only real competition is facebook itself. Facebook back is a better tool for creating a backup of your facebook photos and videos because of several reasons. The first is that requesting a backup of all of your photos and videos through facebook may take several days where as facebook back is instant. The second is that the facebook backup request only includes photos and videos that you have uploaded yourself. Facebook back does this as well as allows you to download photos and videos uploaded by your friends that they have tagged you in.